Interact with this applet for a few minutes, then answer the questions that follow. 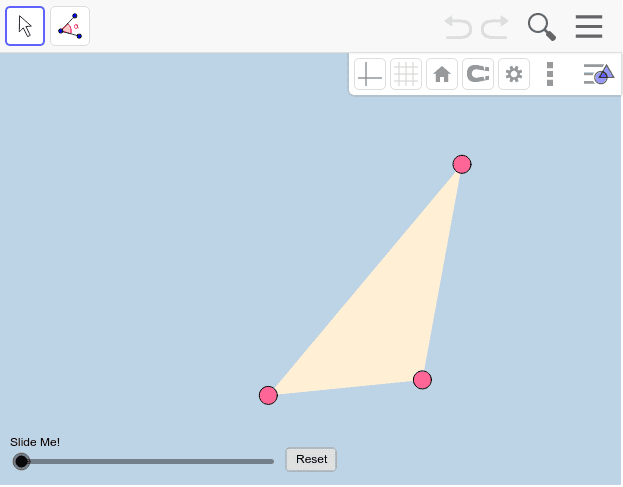 Be sure to change the locations of the triangle's PINK VERTICES before and after sliding the slider! Questions: 1) What can you conclude about the 3 white points? How do you know this? 2) What is the measure of each gray angle? How do you know this? 3) What vocabulary terms best describes each brown dotted line? Why is this? 4) Describe the intersection of these 3 brown dotted lines. How do they intersect? 5) Use the angle tool to now measure and display the measures of this triangle's 3 interior angles. For angle measures > 180 degrees, use the menu (upper right hand corner) to adjust this. Point C is called the circumcenter of the triangle. Drag the pink vertices around to help you answer the new few questions. 6) Is it ever possible for the circumcenter to lie outside the triangle? If so, how would you classify such a triangle by its angles? 7) Is it ever possible for the circumcenter to lie on the triangle itself? If so, how would you classify such a triangle by its angles? And if so, where exactly on the triangle is the circumcenter found? 8) Is it ever possible for the circumcenter to lie inside the triangle? If so, how would you classify such a triangle by its angles? 9) What is so special about the green circle with respect to the triangle's pink vertices? 10) What previously learned theorem easily implies that the distance from the circumcenter to any vertex is equal to the distance from the circumcenter to any other vertex?